Les travaux réalisés en collaboration avec le Dr Teissier (Montpellier, Shoulder Unit Surgery, Hopital Saint-Jean) ont été publiés dans International Orthopaedics. Les principaux résultats montrent que grâce à cet implant moderne sans tige, il est possible d’opérer les cas compliqués d’arthrose post traumatisme (fracture, nécrose…) sans réaliser d’ostéotomie. L’absence d’ostéotomie humérale est un atout majeur, améliorant les résultats post-opératoires et diminuant les complications. L’article est référencé pubmed : http://www.ncbi.nlm.nih.gov/pubmed/26907878, The final publication is available at link.springer.com. Ballas – Stemless shoulder prosthesis for treatment of proximal humeral malunion does not require tuberosity osteotomy. Stemless shoulder prosthesis for treatment of proximal humeral malunion does not require tuberosity osteotomy. Ballas R1,2, Teissier P3,4, Teissier J5. 1Service de chirurgie orthopédique, Hôpital de Saint-Pierre, Université de La Réunion, BP 350, 97448, Saint-Pierre Cedex, Ile de La Réunion, France. richardballas@yahoo.fr. 2Laboratoire IRISSE (EA4075), UFR SHE, Université de La Réunion, Le Tampon, Ile de La Réunion, France. richardballas@yahoo.fr. 3OrthoSud Shoulder Unit, Clinique Saint-Jean, Montpellier, France. 4Service de chirurgie orthopédique, CHU Carémeau, Nimes, France. 5Hand and Upper Limb Institute, 15, avenue du Professeur Grasset, 34000, Montpellier, France. 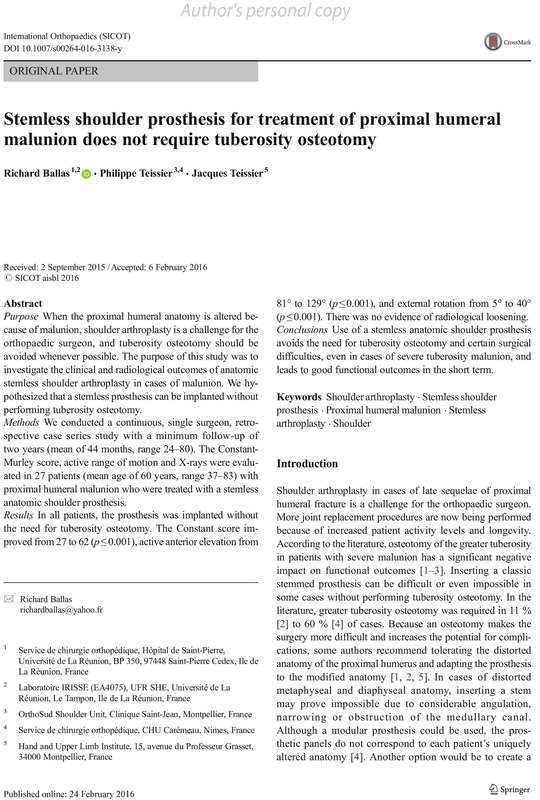 When the proximal humeral anatomy is altered because of malunion, shoulder arthroplasty is a challenge for the orthopaedic surgeon, and tuberosity osteotomy should be avoided whenever possible. The purpose of this study was to investigate the clinical and radiological outcomes of anatomic stemless shoulder arthroplasty in cases of malunion. We hypothesized that a stemless prosthesis can be implanted without performing tuberosity osteotomy. We conducted a continuous, single surgeon, retrospective case series study with a minimum follow-up of two years (mean of 44 months, range 24-80). The Constant-Murley score, active range of motion and X-rays were evaluated in 27 patients (mean age of 60 years, range 37-83) with proximal humeral malunion who were treated with a stemless anatomic shoulder prosthesis. In all patients, the prosthesis was implanted without the need for tuberosity osteotomy. The Constant score improved from 27 to 62 (p ≤ 0.001), active anterior elevation from 81° to 129° (p ≤ 0.001), and external rotation from 5° to 40° (p ≤ 0.001). There was no evidence of radiological loosening. Use of a stemless anatomic shoulder prosthesis avoids the need for tuberosity osteotomy and certain surgical difficulties, even in cases of severe tuberosity malunion, and leads to good functional outcomes in the short term.